Did you hear the news? “Eggo Waffles now have colors and flavors from natural sources!” My kids grew up loving all of the fun Eggo Waffle varieties like the Kellogg’s® Eggo® Blueberry, Strawberry, and Chocolatey Chip Waffles, but I stopped buying them because of the ingredients. Now that Kellogg’s has improved their recipe I’m ready to add them back to our menu starting with a dessert using Eggo® Cinnamon Toast. 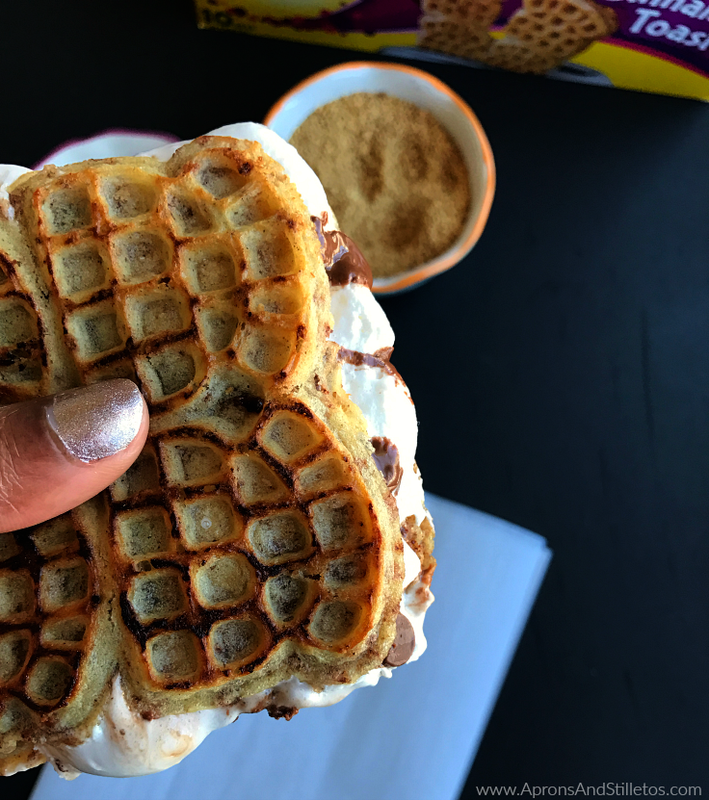 The single slice of Eggo Cinnamon Toast is the perfect little canvas for a twist on smore’s. 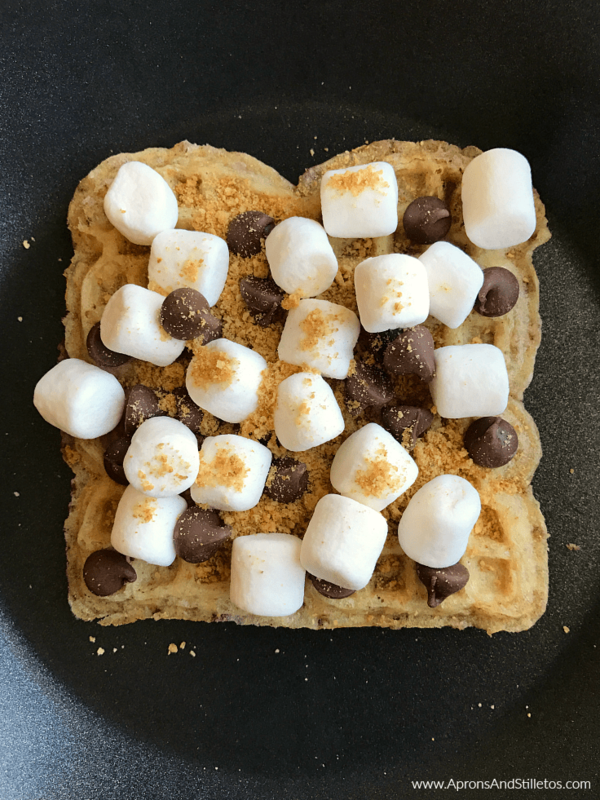 This soft, crunchy, cinnamony Eggo topped with graham cracker crumbs, chocolate and marshmallow will have your kids drooling. 1. Heat a small pan on medium heat. 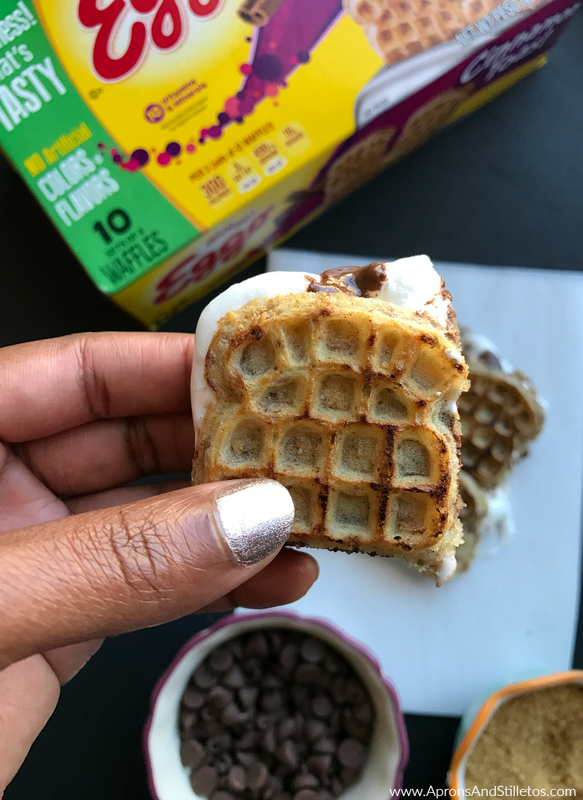 Place one Eggo® Cinnamon Toast waffle in the pan and top with 15-20 marshmallows and milk chocolate chips. Sprinkle on a teaspoon full of graham cracker crumbs. Top with another Eggo® Cinnamon Toast waffle and heat until brown on both sides flipping halfway through the cooking process. Allow the waffle to cool a few seconds before cutting into mini waffles. The bite-sized smore’ waffle sandwiches are so yum! I made some for the kids after school, then we made a few more for dessert. This sweet and gooey dessert is so quick and easy to make and gives you a different way of using frozen waffles. 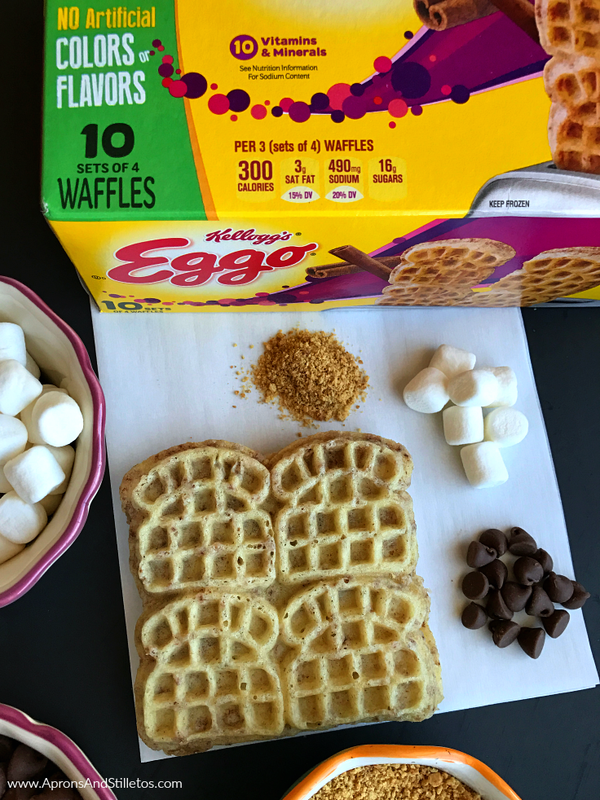 There are a bunch of Eggo waffle flavors you could make this with and don’t worry, the entire Eggo product line at Walmart uses colors and flavors from natural sources. Look for the new Eggo® packaging on the freezer aisle at Walmart and pair your purchase with this ibotta offer. Earn $2 when you purchase ONE Eggo® Breakfast Sandwich, Bacon or Sausage varieties only, 8 ct. box only at Walmart here. This looks like an yummy evening snack recipe.definitely going to try this one. Absolutely love this…would be great for camping or just a Sunday afternoon treat! Welp there goes my diet hahhaa those are so perfect . You know what this would make a perfect eggo waffle too hmmm i thi k you are onto something . I love your creativity! These look so delicious. 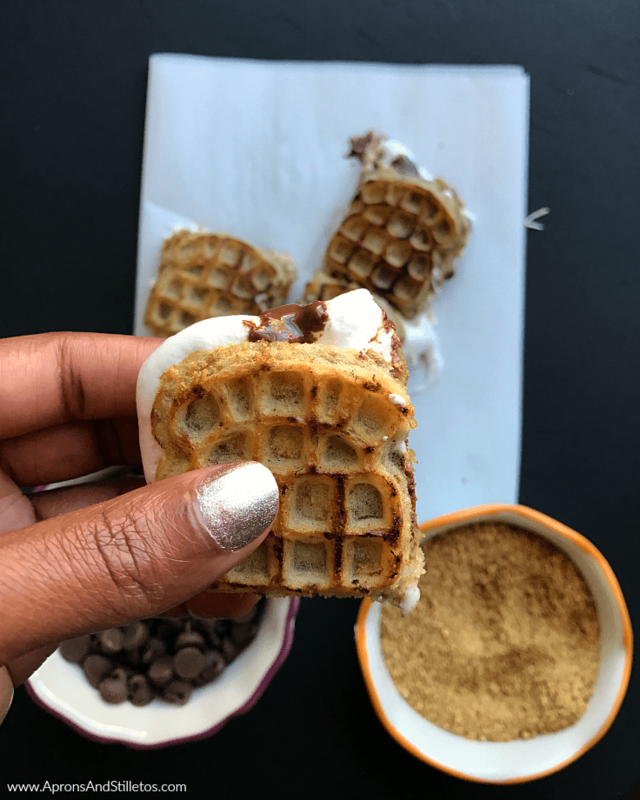 S'mores are one of my favorite sweet treats and this is a lot cleaner than trying to attempt the graham cracker sandwich! These look really good. We have a snow day today. Might be the time to try them. Ok, first things first! Food looks delish but your nail polish is to die for! What brand is it? It's Sally Hansen's "Gilty Party"
wow these are little cute waffles! Perfect for snacks 🙂 Yummylicious! Nope! This is a super easy recipe. Love this! Waffles are one of my favorite breakfast foods, so I'm totally pinning this to hopefully get to one day! I never would have been creative enough to think of this myself. I only ate one since I work out I didn't want to kill my results. What an awesome idea! I never would have thought of this! Wow, when I read mini-Smore, I knew that I'd love this post. Then, I saw that photos and loved it even more! Great job! Oh my, this looks really good. I've only ever had the plain waffles but, this I've got to try. Thanks for the recipe. Oh man that looks good!! I can't recall the last time I had mini Eggo! I thinks years and years, when I lived in Florida. I miss them. I haven't seen any at my local grocery store. The new packaging with not artificial color/flavors are rolling out this month. Yummy indeed! I will have to make this too. I will be babysitting my grandchildren this weekend and this would be a delicious treat for them after their playtime. These would be great for an after school snack bar! My son always has friends coming home with him and this is something the tweens could easily make on their own! Now that looks delicious! Love the idea of making it into a smoke! These look delicious and I bet kids especially love them. I love the little mini waffle size, too. I love the size too. I can eat one or two and not throw my whole workout week away with all of this sweetness. This looks so yummy. I never would have thought to use waffles when making Smore's, this is a fantastic idea. I thought it would be a good way to switch things up and instead of a crunchy cookie a soft crunchy sweet waffle. Well obviously I have to try these ASAP! How fun and cute! Perfect for Spring and sumemr! So true! They'd be perfect to melt the marshmallows over a campfire and use the Eggo waffles.